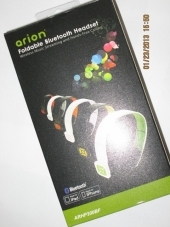 Bluetooth headsets are typically much further from headphones both on quality standards and sound quality. Most headsets are monophonic sound channel and thus aren’t guaranteed to put out the best quality. Having a headset in Bluetooth allows you to have phone conversations and listen to your portable media. Now Eagletech came out with Arion Foldable ARHP200BF, which is about 70$ at your regular internet retailers. This headset has omnidirectional microphone that picks up wonderfully leading to great conversations with little to no lack of hearing. 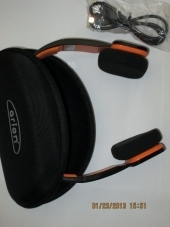 The headset has a unique foldable ends look where both pieces fold in on each other allowing for a small and compact carry case, about the size of regular sunshades. The headset comes in multiple colors variations, including but not limited to black and red, orange and red, white and green, and more. 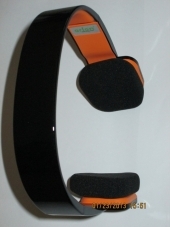 The right ear cup contains all of the main functionality buttons such as the calling button and the volume keys, while the left ear cup has the power-meter button which shows the amount of batter left. Being able to pair up to 8 devices by holding the center button for a few seconds, you will never have to reset the Bluetooth device again. Lastly, the battery life from my own personal experience using Pandora internet radio, and answer a few calls, lasted between 6-8 hours on constant use. For cellphone use you will have excellent voice quality, being able to pick up much more sound and clarity of voice than an average Bluetooth ear piece. For music use I was surprised with the clarity of mid ranges and even some basses were kept very solid and not crackling. In retrospect, this headset has a very good base-line quality piece of hardware and for 69.99$ is a very decent choice for listening to music, going to the gym, or taking calls at home. It has a stylish look, and very many different colors to choose from. The battery life is a definite plus, and the wireless capabilities are excellent. From my own personal uses, I choose this headset over many others for both price and style. I love this one, hope to see it go wireless also..